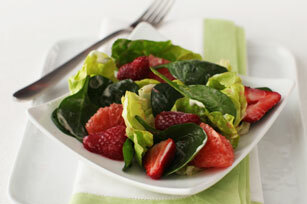 A strawberry-citrus spinach salad to knock your socks off! Fast, fresh and tasty, this spinach salad is anything but ordinary. Mix Miracle Whip, lime zest, juice, milk and honey until blended. Substitute 1 navel orange for the grapefruit, and 1/2 cup dried cranberries for the halved strawberries. The flavour of this simple salad is sure to amaze you. And as a bonus, the spinach, lettuce and grapefruit all team up to provide an excellent source of vitamin A, per serving.